24 hours a day, 7 days a week. That’s the #towpink promise. We’re the leading resource for roadside tire changes, fuel delivery, jump starts and lockout services in Vancouver and Battle Ground. Chappelle’s is a Preferred Provider of AAA service, and we’re an approved vendor for most auto insurance plans: we’ll even bill your insurer directly if we can. Our tow trucks are ready and able to serve a variety of customer needs. We have eight “Self Loader” boom/wheel-lift trucks and flat beds equipped with state of the art machinery. This ensures that our friendly and experienced technicians can tackle any problem, and get the job done quickly. 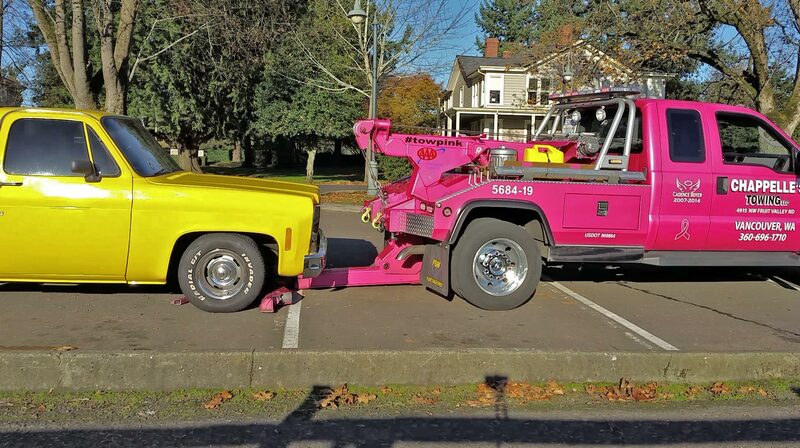 Chappelle’s is always available to clean up after auto accidents and tow away disabled vehicles. We take the responsibility of clearing away cars and freeing up traffic very seriously. We also know that car accidents are traumatic, no matter how minor, so we keep teddy bears on hand to comfort children who might be involved. There’s nothing more annoying than dealing with a strange car on your private property. If there is a car parked illegally or abandoned in your parking lot, we’ll be glad to haul it away for you. Our impound lots in Vancouver and Battle Ground, WA are secured facilities where drivers can retrieve their vehicles. All cars, trucks, vans, SUVs, and motorcycles that aren’t picked up are auctioned off to the public every Thursday at each of our locations. You can get a good car for a great deal!